North Korea: A Short-Lived Launch Moratorium? Figure 1: Musudan is North Korea’s original launch site and Tonch’ang-dong is its new site. Naro is South Korea’s launch site. The North Korean news agency announced today that North Korea plans to attempt to launch a satellite into orbit sometime between April 12-16. To essentially everyone outside North Korea, this appears to fly in the face of its recently announced flight test moratorium for long-range missiles, since the technology for space-launch vehicles can be used for long-range missiles. Pyongyang is arguing that this is a space-launch for peaceful purposes and therefore doesn’t fall under its moratorium. It’s not clear if the North really believes this and plans to carry out the launch, or if it is part of its routine of keeping negotiators off balance. There are a number of examples in the past of the US seeing preparations that appeared to be for missile tests that were then postponed. In this case, North Korea has to decide how serious it is about this launch since it is certain to bring about the end of food aid—basically before it started—and would derail diplomatic efforts, which Pyongyang appears to want. The North announced that its planned satellite, the Kwangmyongsong-3, will be a “polar-orbiting earth observation satellite,” and that it would be an operational satellite, unlike the two experimental satellites it previously attempted to send into orbit. While Pyongyang said both of those earlier launches were successful, malfunctions of both launchers kept the satellites from reaching orbit. North Korea said this launch will use its new Tongch’ang-dong launch site (Figure 1) and it will launch south, similar to the path South Korean missiles have used (Figure 2). Launching in this direction avoids overflying Japan early in the launch. 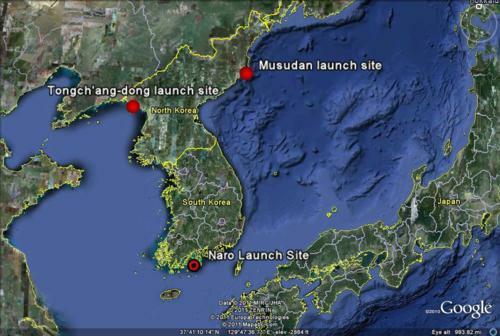 North Korea’s previous launches were eastward and overflew Japan, which caused Japan to go ballistic. I discussed the new launch site on the 38North site last year. Figure 2: South Korea’s 2009 and 2010 satellite launch attempts followed the yellow path. 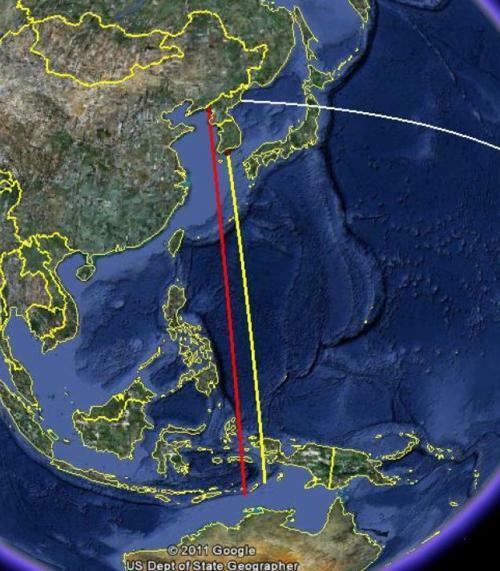 North Korea’s launch could follow the red path. The white line shows the path of North Korea’s Unha-2 in 2009 from its Musudan site. For a discussion of North Korea’s last launch attempt, click here. The Washington Post quotes Victor Cha as saying the launch is intended to help North Korea “perfect their reentry heat shield for a ballistic missile,” but this seems unlikely. The final stage of a successful satellite launch would not reenter the atmosphere like a missile warhead would, and a failed launch would not get up to the speed of a long-range missile. A launch would help it test its rocket engines, guidance, and staging technology. The original KCNA press release is here.